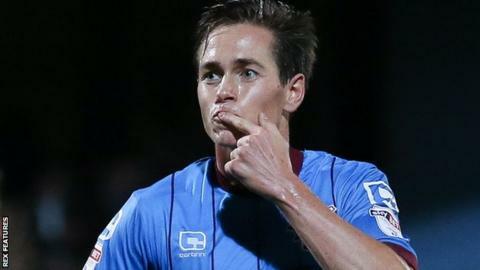 League One top scorer Josh Morris netted a hat-trick as leaders Scunthorpe United cruised to a 4-1 win at Walsall. Scunthorpe could have led inside 20 seconds when Duane Holmes pounced on Kevin Toner's under-hit backpass, but he fired wide with only keeper Neil Etheridge to beat. But they only had to wait until the 11th minute to break the deadlock when Liam Kinsella handled from a corner and Morris swept home the penalty. It was 2-0 on 13 minutes when Etheridge saved well from Tom Hopper only for Morris to slam home the rebound. Walsall pulled a goal back in the 45th minute when Erhun Oztumer finished a neat run by finding the bottom corner from 18 yards. They could have been level seconds later, but Simeon Jackson was foiled from close range by Iron keeper Luke Daniels. That save would prove key as, just two minutes into the second half, Scunthorpe midfielder Neal Bishop lashed home from 25 yards. Etheridge made fine saves from Holmes, Sam Mantom and Hopper to keep Walsall in it, but Morris curled a beauty into the top corner to make it 4-1 on 83 minutes and substitute Kevin van Veen almost added a fifth with a lob that clipped the bar. Match ends, Walsall 1, Scunthorpe United 4. Second Half ends, Walsall 1, Scunthorpe United 4. Simeon Jackson (Walsall) hits the bar with a left footed shot from the centre of the box. Andreas Makris (Walsall) is shown the yellow card. Harry Toffolo (Scunthorpe United) wins a free kick on the right wing. Foul by Andreas Makris (Walsall). Jason McCarthy (Walsall) wins a free kick on the right wing. Kevin van Veen (Scunthorpe United) hits the bar with a right footed shot from the right side of the box. Attempt missed. Franck Moussa (Walsall) left footed shot from the centre of the box is close, but misses to the right. Attempt blocked. Sam Mantom (Scunthorpe United) left footed shot from outside the box is blocked. Corner, Scunthorpe United. Conceded by Jason McCarthy. Substitution, Scunthorpe United. Kevin van Veen replaces Tom Hopper. Goal! Walsall 1, Scunthorpe United 4. Josh Morris (Scunthorpe United) left footed shot from the centre of the box to the top left corner. Assisted by Scott Wiseman. Attempt missed. David Mirfin (Scunthorpe United) header from the centre of the box is close, but misses to the right. Corner, Scunthorpe United. Conceded by Amadou Bakayoko. Corner, Scunthorpe United. Conceded by Neil Etheridge. Attempt saved. Tom Hopper (Scunthorpe United) header from the centre of the box is saved in the bottom left corner. Substitution, Scunthorpe United. Stephen Dawson replaces Duane Holmes. Corner, Scunthorpe United. Conceded by Erhun Oztumer. Attempt missed. Simeon Jackson (Walsall) header from the centre of the box is close, but misses to the right. Substitution, Walsall. Andreas Makris replaces Kieron Morris. Foul by Richard Smallwood (Scunthorpe United). Erhun Oztumer (Walsall) wins a free kick in the defensive half. Tom Hopper (Scunthorpe United) wins a free kick on the left wing. Attempt missed. Amadou Bakayoko (Walsall) left footed shot from outside the box misses to the left. Attempt blocked. Duane Holmes (Scunthorpe United) right footed shot from outside the box is blocked. Attempt saved. Duane Holmes (Scunthorpe United) left footed shot from the centre of the box is saved in the top left corner. Attempt saved. Kieron Morris (Walsall) left footed shot from outside the box is saved in the bottom right corner. Attempt saved. Tom Hopper (Scunthorpe United) header from the left side of the box is saved in the bottom right corner. Tom Hopper (Scunthorpe United) wins a free kick on the right wing. Sam Mantom (Scunthorpe United) wins a free kick in the defensive half. Foul by Franck Moussa (Walsall).